Tempe, fermented soybean cake from Java, Indonesia, is a very common alternative for vegetarians in the world. Rhizopus fermentation on the boiled soybeans not only binds the soybeans together and gives solid form, but also enhances its nutrition contents from its protein, dietary fiber, and vitamins. “Indonesia’s local wisdom actually involves high technology. Eating tempe is an ancient culture and in that time, our ancestors already applied fermentation technology for their everyday uses. For me, it is something to be cherished,” said Asri Saraswati Iskandar, co-founder of Agradaya. Found in 2013 at Yogyakarta, Agradaya aims to economically help local villagers of Yogyakarta by producing healthy and good quality agricultural products. “I think the most effective way to boost our economy is back to village and work with farmers. However, the process does not stop there. The crops should be processed into high-quality end products in order to increase its value,” said Asri. Some examples of their products are natural tempe and emping melinjo (chips from paddy oats strobilus). Agradaya’s Emping Melinjo even already penetrates European market with the help of Jakarta-based local food store Javara Indonesia. “Meanwhile for tempe, we partner with four local women to produce up to 20 kilograms of tempe per days. The tempe is mostly sold locally to fulfil Yogyakarta demands,” said Asri. Asri again applies one of the most ancient fermenting technologies on the local-grown and non-GMO soybeans. Instead of using artificial tempe yeast, Asri uses usar, natural yeast grows on dry leaves of waru or Hibiscus tilaeus, a species of flowering tree from Malvaceae family. The tree naturally grows in abundant quantity around Yogyakarta. “The result is quite different from artificially fermented tempe. It is better for our digestion as natural yeast doesn’t produce heat as high as the artificially fermented tempe,” said Asri. Asri also stated than the local wisdom she learnt at the village affects her body in a good way. It makes her healthier and happier as all ingredients are guaranteed organic. “I was born in Jakarta and living there until I move to Yogyakarta 2 years ago. For me, this natural-based lifestyle has transformed me into a better person and this how our ancestor lived in the past. It indeed proves that Indonesian way of life is actually very good for our body,” said Asri. In a pleasant Saturday morning (12/12), Agradaya team partnered with Songolas and Burgreens on hosting “Fermenting Tempeh at Home” workshop at Pasar Ragam, Rempoa, Jakarta. The process is actually quite simple despite consuming days to do from scratch. In the workshop, Asri and Agradaya team did a presentation about tempe-making process before the participants learn and practice their skill on making tempe. The practice was emphasized on the fermenting part. “We hope that all participants understand the process and start to make tempe from scratch at home after this workshop,” said Asri. The ingredients needed in the process are 250 grams local-grown soybeans, water, and usar (natural yeast) of one waru leaf. The tools needed are a stove, a soaking pot, a boiling pot, a draining tray, and a rice ladle. Here, Asri elaborated the tempe making process to Restobazaar. 1. Wash soybean with running water until it is clean, then soak the soybeans to 10 hours until it forms a layer of foam on the water surface. The soaking process helps to soften soybeans husks so that it will be easier to peel. Besides that, this process helps to hydrate the beans. 2. Wash again the soybeans and at the same time, crumple the beans to peel it. This process means to help rhizopus mycelium penetrating soybeans during fermenting process. 3. Boil soybeans for 1,5 to 2 hours in order to soften the beans even more. This process means to help the beans absorb lactic acid formed on the second soaking. 4. Drain the soybean and soak it for 8 hours to create natural lactic acid fermentation on the beans. The acidity is needed on rhizopus growing. This process also meant to add nutritional value and eliminate toxin that maybe grows on the beans during the previous process. The fermentation is marked by acidic smell and a layer of foam on the surface of the water. 5. Wash again the soybeans and boil the soybeans for 30 minutes. This process is meant to remove toxin and bacteria that possibly grew during the previous process. 6. Put the soybeans on a draining tray until it cools down. After that, rub usar on the beans until the white surface of the leaf is transferred to the beans. 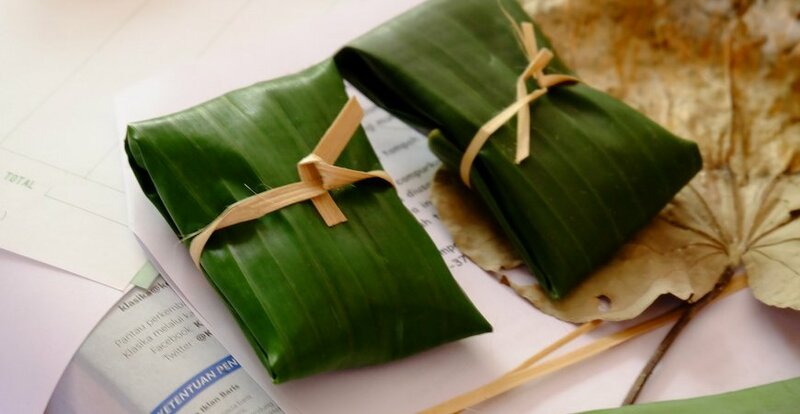 Wrap it with banana leaves that are already torn a bit to provide air circulation. 7. Store tempe in 20-37°C temperature for three days, then put it on the fridge to stop its fermenting process. “This tempe can be stored for 3 days. However, it can be decomposed up to one month to create tempe bongkrek, a natural umami as MSG substitution,” said Asri. The legumes than can be processed into tempe is not only soybeans, stated Asri. There are many kinds of legumes to process such as mung bean, koro beans, benguk beans, and even red bean depends on our creativity. One waru leaf is used for two kilograms of beans. “However, the process will be different in the time,” said Asri.